Electronic money issued by domestic commercial banks will be circulated for the first time in the financial markets next year. Unlike Bitcoin or Ethereum, which is a virtual currency where the price is determined in the market, this is the first electronic money in Korea to be exchanged 1:1 with traditional fiat currency. Since the blockchain network is used, the cost of transactions such as remittance can be reduced and the service can be extended to the whole world. Especially, security is the most important factor for any hacking attack. Woori Bank announced on the 16th that it has signed a business agreement with fintech companies, DAYLI Intelligence and theloop, for cooperation in the blockchain and digital money business. Through this agreement, each company will cooperate for internal verification of the blockchain technology and will mutually support the issuance, use and charging of its own digital money. This electronic money, which is issued on the basis of a private blockchain network constructed by Woori Bank, has a value of 1 won per digital coin. This will be charged to a card or smartphone, smart vending machines, and merchants will be able to make simple payments and simple remittances. Woori Bank plans to use digital money as a ‘prepaid electronic payment instrument’. It is easy to understand if you think about ‘T-money’ which is used for payment of transportation expenses. It can be used as payment means for general commercial transactions, and it is also possible to transfer and transfer money at low cost. Since it uses a blockchain network, there is no need to construct a dedicated network for utilizing the electronic money, which can save costs. In the future, services that utilize electronic money can be extended indefinitely as well as domestic, where blockchains are connected. Especially, it has the advantage of being safe against hacking attacks unlike existing banks. 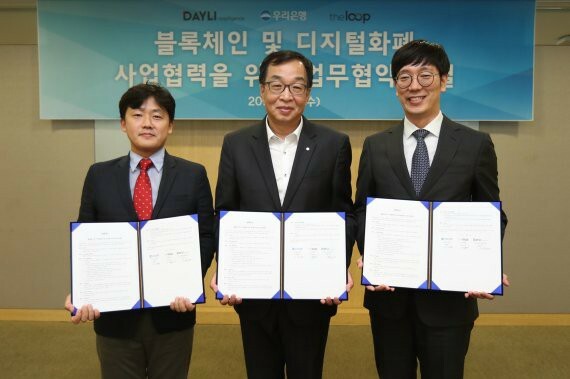 DAYLI Intelligence and theloop, which cooperated in this collaboration, were selected for blockchain pilot project by the Ministry of Information and Communication / Ministry of Science and Technology in April. U-Coin is another digital currency project currently available at three campuses including Sogang University, Korea University and Pohang University of Technology, and at nearby merchants. Currently, these universities are using U-Coin to pay scholarships and pay tuition fees, and are expanding their connections to local organizations. Woori Bank uses U-Coin’s transaction method to introduce the bank’s digital money as a step of issuing, charging, payment and remittance. If the currency issue is successfully concluded by the end of the year, the goal is to commercialize digital money from next year. We will also apply it to existing systems such as “WeHoney Money”, and plan to bring real benefits to customers. Woori Bank official said, “Since only the virtualization abolition that uses the blockchain network is issued within the system, it is possible to do currency transaction without the process of mining or settlement like the existing one.” I expect more benefits to be available, “he said.